The "Hook Mountain Massacre" SoundPack gives you the complete audio solution when playing the "Hook Mountain Massacre" Adventure. All the preparation is done for you, and every sound you'll need is right at your fingertips. The third installment of the Rise of the Runelords Adventure Path begins with a desperate call for aid from Hook Mountain. A tribe of ogres has slaughtered the garrison of a small keep. The few surviving rangers need the heroes to help them retake the key fortification back. 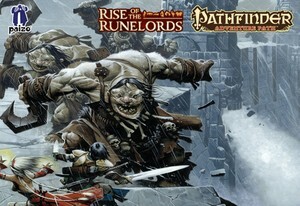 Pathfinder Adventure Path: Rise of the Runelords Anniversary Edition, The Hook Mountain Massacre © 2012. Paizo Inc., the Paizo golem logo, Pathfinder, and Pathfinder Adventure Path are trademarks of Paizo Inc. Author: Nicolas Logue. SoundSet © 2014. Sounds created under license with Paizo Inc.